I have already written about how I, a city boy from Bombay, came to be in the heartland of America. My welcome there was memorable to say the least and I was convinced that it was to be a brief interlude until I found a job on the coast. Winter was cold and bleak and work was a different beast from what I expected after all those year in the education machine. Columbia was centrally located in Missouri, almost halfway between St. Louis (the gateway to the west) and Kansas City on I-70 one of the major arteries of the Midwest. I liked to describe it as the middle of nowhere ( I still do, though more out of fondness than malice). I gradually discovered that Columbia, Missouri had a lot of redeeming features which I will talk about in this post. 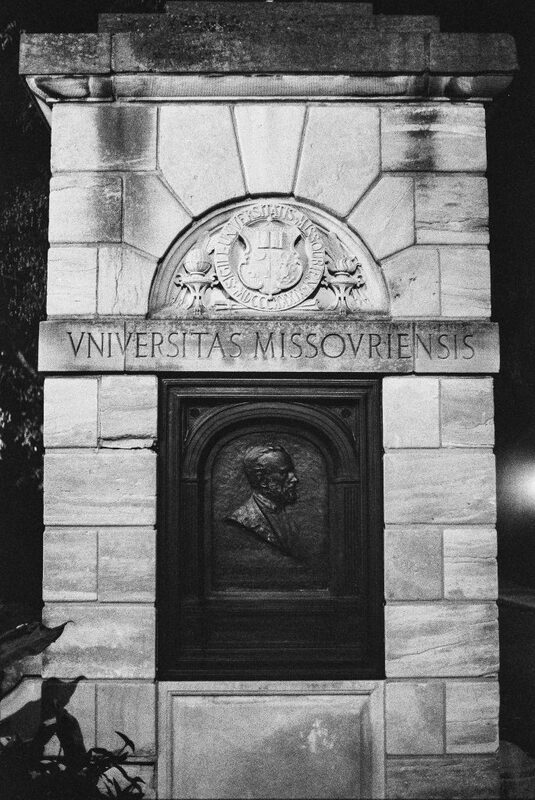 Inscription at the entrance of the University. Self-shot. 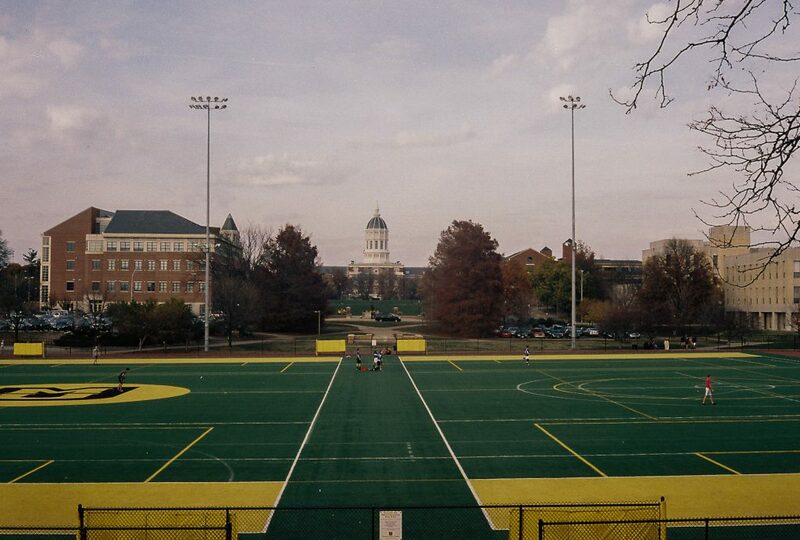 Chief among them (and a major contributor in all other factors) is the presence of the University of Missouri-Columbia. The flagship University of the UM system, a land grant university and the first to be established west of the Mississippi in 1839. 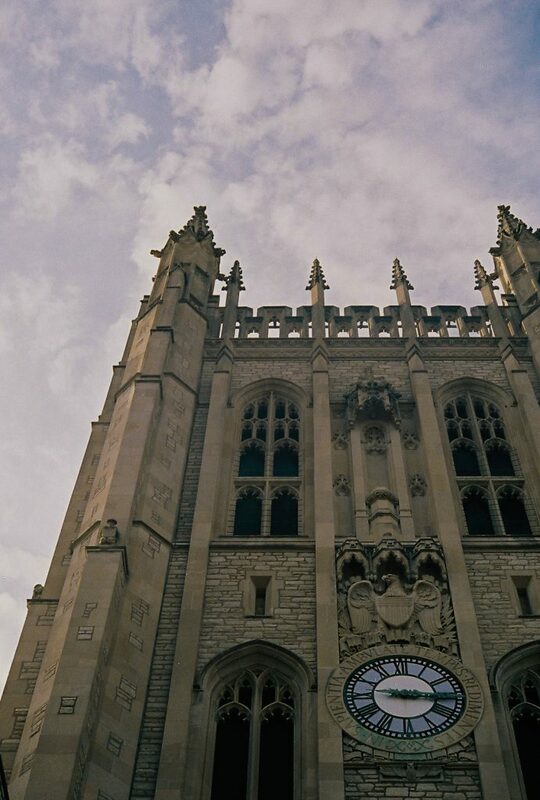 The University was steeped in history and attracted people from the world over. Some for its famed courses in medicine and journalism and some (mostly American) for its great football program. The age of the University meant that the town had grown up around it which I felt was an aspect unique to old universities. So you could sit at the base of the iconic Columns (more on that below) at the Francis quadrangle and then stroll to Broadway to enjoy some of the great bars and restaurants that dotted downtown. The University, is a place, as universities are wont to be, where history is constantly being made. I will always remember being present when a new chapter in American race relations was written there and always regret not having participated or even spectated more. Much like other universities, life centered around a quad (The Francis Quadrangle) in the middle of which stood the Columns. These columns were all that remained of the Academic Hall after a fire in 1892. The fire was reportedly cause by the first light bulb in use west of the Mississippi. 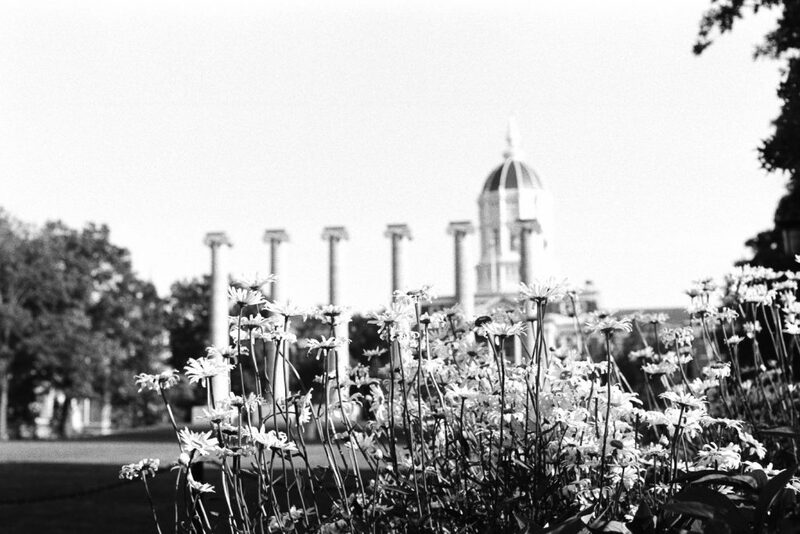 Today the columns stand as a symbol of the University at the center of campus life. I have spent many an hour sitting (or lying) at the base of the columns and just soaking in the University atmosphere. A number of rituals revolve around the quad and it is an inescapable Columbia landmark. Around the quad,there are number of noteworthy buildings: Jesse Auditorium and Reynolds school of Journalism to name a few. This was also the site of many of the BLM protests in 2015. Curiously understated is the presence of Thomas Jefferson’s original tombstone (a white obelisk designed by the man himself and donated to the University by his family) which is place in front of the charming Chancellors Bungalow. Growing up I would look forward to the Sunday Times for two reasons. Excellent editorials by Jug Suraiya and Bachi Karkaria and the Sunday comic strips. Favorite amongst the Sunday funnies for me was Beetle Bailey. Never in a million years did I think that I was going to end up in his alma mater. Discover my joy when I found out that a number of places in the strip were actually from Columbia. The strip below actually shows Francis quadrangle sans the columns (which would have been a dead giveaway). The University remembers its alumni with the recreation of “The Shack“- a favorite hangout of Beetle’s in the student center and a life size bronze statue of Beetle Bailey in from of the Alumni center. The Memorial Union is community center erected in the memory of a 117 Mizzou Alumni who lost their lives in WW1. The union has a distinctive bell tower and an arch beneath the bell tower where the names of the 117 fallen men are inscribed. Students are expected to show respect by speaking in whispers and uncovering their heads while passing underneath the Archway. I always loved strolling past the Union because of its meticulously maintained flower beds and splendid architecture. Many a happy hour of my time in Columbia was spent playing sand volleyball and cricket on Stankowski (despite the latter being expressly forbidden). Originally the Football field for the Tigers named the Rollins field, the facility was renovated with a running track and sand volleyball courts in 1996. It is a great place to walk and over the semester breaks, there are plenty of events happening with Greek societies around the field which often spills over on to the field. Looking over Stankowski field at Jesse Auditorium. There was plenty around town other than the University. True/False is one of largest annual documentary film festival in the world. It generally takes place in the first week of March and attracts large numbers of people to Columbia. For a weekend, Downtown Columbia aka The District transforms into something more akin to Cannes than a town in the heart of Missouri. I was fortunate to attend a number of great showings in the 3 years that I have attended the festival.My only regret being that I missed it the first two years out of sheer ignorance. True/false offers much more than viewing documentaries. There are art installations all over the city which showcase a wide number of artistic media. It offers you the ability to interact with the film makers and subjects of films and queuing for films is a great way to meet people who have traveled from across the world to participate in the festival. I have many a fond memory of queuing up outside theaters in near freezing temperatures, shivering and taking gulps from a steaming cup of hot chocolate with friends waiting in line to see movie that would broaden my horizons. The Blue Note is an legendary Columbia venue where there is always something interesting on. During True/False, the venue is part of the festival and most of my experiences with the Blue Note have been through the festival. I did go there for a Pink Floyd cover band and a special screening of Elf for Christmas and the venue has a charm all its own. It has played host to now famous people like Jon Hamm and Brad Pitt (erstwhile MU alumni). There are nice establishments around the theater where you can catch a drink or dinner before a show. A whimsical hipster-y hangout which opens for breakfast and has a theater for small shows later, the menu at Cafe Berlin is filled with quirky items which are a must have when one is in Columbia. The venue is well known and lines are long so get there early and it may be a 15-20 minute wait for a table. A number of places lay claim to the best burger in town. The snooty (cash only) Booches is by far the most well known with 44 Stone being mentioned often as well. But my money always goes to the Billiards Burger. A great burger that offers value for money and a relaxing atmosphere to hang out with your friends.